Ibis Styles Hotels is an internationally acclaimed name in the field of hotels and has been a favourite amongst the people who love to spend a grand stay at a hotel but at a relatively cheap cost. 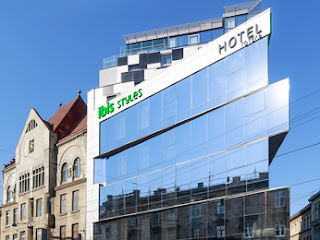 As Wikipedia describes them, Ibis Styles Hotel is "an international chain of unique, non-standardised, basic service economic hotels", that are owned by AccorHotels. The hotels are renowned for their unique sense of design, that is to say, no two hotels have the same architecture or infrastructure. 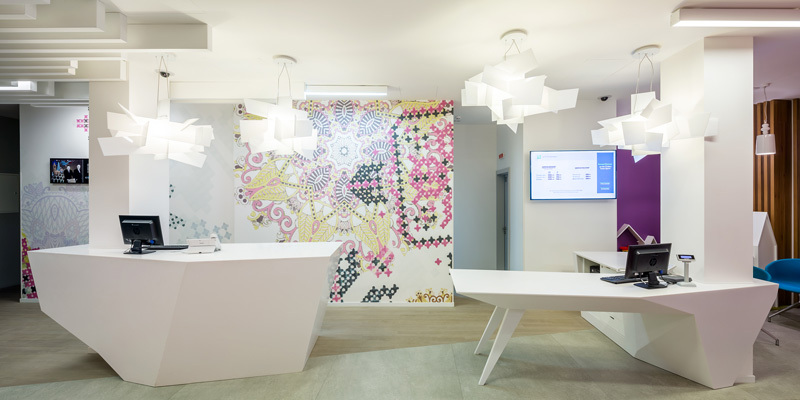 Each boasts off a different set of patterns, ideas and designs for its aspects and interior. The hotels further offer all-you-can-eat buffets, economic prices and affordable accommodation. What's more, the amenities do not just end there, the hotels further offer complementary food and beverage services, scilicet, tea and coffee, on-site continental breakfast service; and for the cherry on the top, there is also internet access. It's beautiful, isn't it? Clearly the designers left no stone unturned in achieving their bourne. So today, we are going to take a look at this unconventional yet beautiful hotel in Ukraine, and explore the hotel through its photographs. Exciting, isn't it? As we have already seen the exterior of the hotel, let's explore the interiors of the hotel, one step at a time. So this is the broad view of the interior of the hotel. As is evident from the photograph, the hotel is obviously designed with the utmost of perfection; the colour white dominates the entire decor and is complemented with the softer and bright shades of pink, blue, yellow, which provide a certain vibrancy to the entire decor. 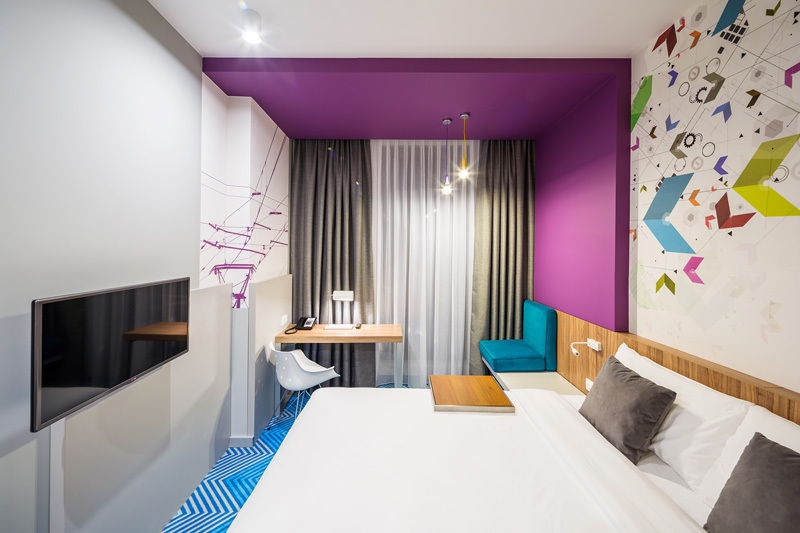 While hotels in Las Vegas often boast off a more regal and elegant reception, the Ibis Styles Hotel in Ukraine presents a counter that is, like its other features, a mix of trendy and voguish design. 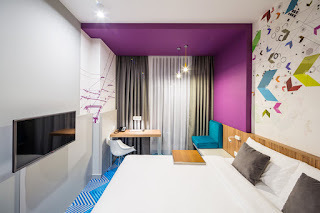 The designers, clearly were not afraid to use quirky designs and we are glad they were not, The abstract architecture and the unconventional design add a certain sense of trendiness to the hotel counter and the prima facie is one of profound appeal. 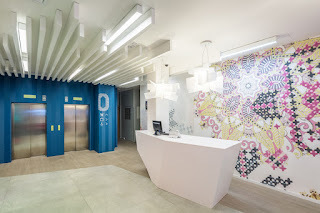 Once you have taken in the entire gamut of fresh ideas that only the counter boasts off (and that includes the beautiful wall art just behind the counter), you will notice the fresh ideas that the designers have put in for the elevators. Yes, even the elevator system get a makeover. The ceiling are adorned with a quirky new set of lights, and the walls are decorated with the floor numbers! If this doesn't impress you enough, then keep on reading and we are sure you will just love the hotel more and more. Now that we have explored the separate parts of the Hotel's lobby, let's focus on the entire lobby for once, shall we? As is evident from the photograph, the lobby offers a hearty and warm welcome to the visitors, and the bright tones of the interior offer an affable ambience. All that we have got to say at this point is that we certainly would love to visit this place at least once. Perfect blend of modern designs, vibrant shades, warm undertones and quirky fashion. What do these plethora of adjectives define? 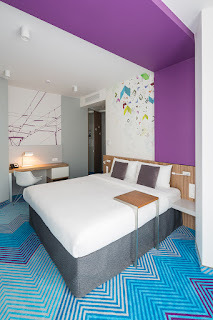 The hall of the Ibis Styles Hotel in Lviv. Yes, just the hall! As you can see in the photograph, the designers have taken their aim to a whole new level with their innovation of what the ideal halls look like. 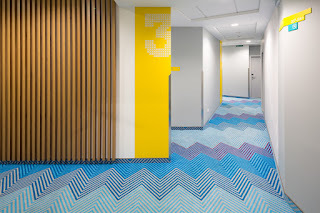 Once you roam around in these halls, even if it is to just get to the elevator, it is almost as if you are taking a walk on a kaleidoscopic surface and fluidic ground. Paradoxical and fascinating. We guess that is the best way to describe this hotel. After all the time we have spent roaming around the hall, it is time we enter our rooms and just relax. And believe you us, it is more than just relaxing to spend an evening in these rooms. 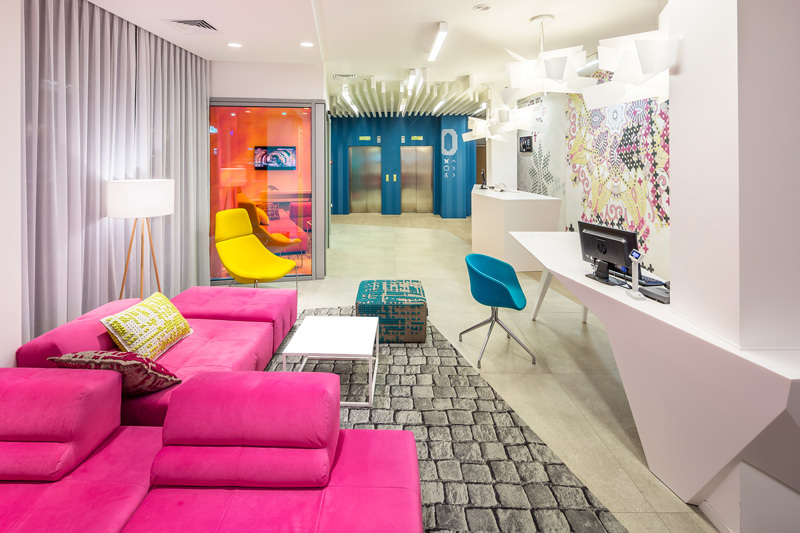 The rooms' interior, just like the rest of hotel's, is adorned with peppy colours and beautiful wall art. 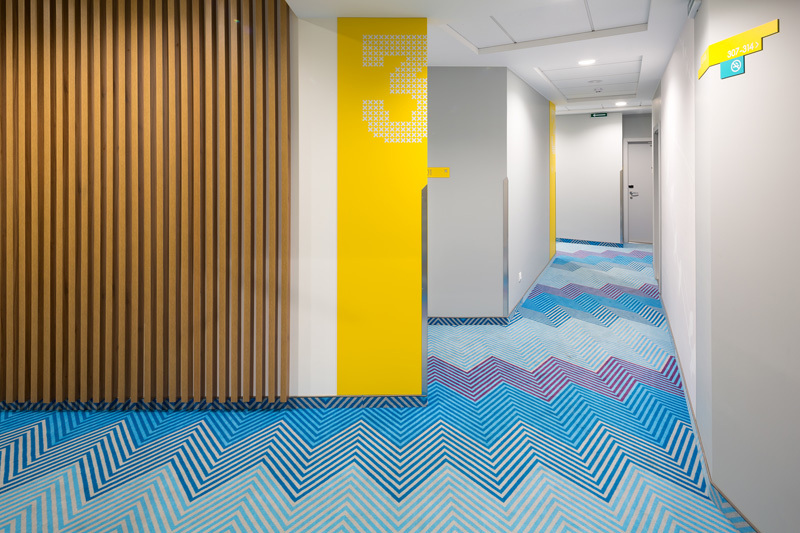 Akin to the halls, the floors of these rooms are also furnished with a fluidic yet abstract design and appeal to the eyes instantly. Just look at the photograph and you will know what we mean. 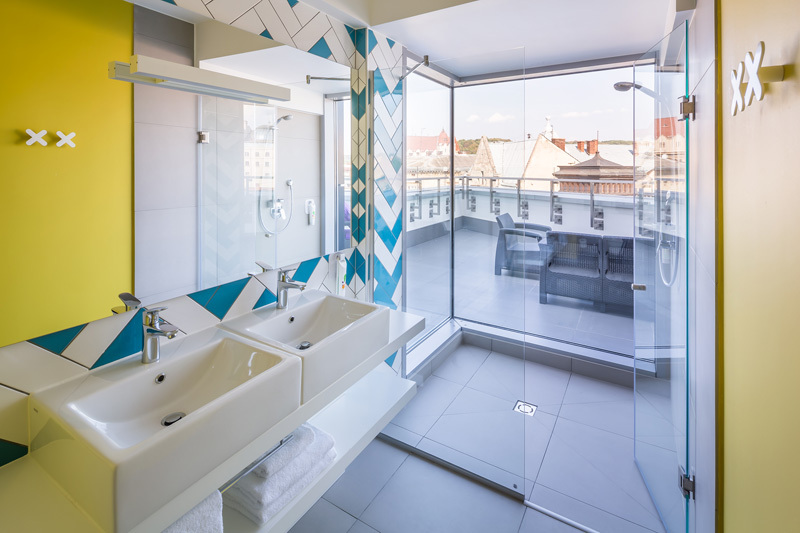 We know that what really accentuates a stay at a hotel, is the comfort of the bathing experience you get there, and the relaxing feel of the entire room. Surprisingly enough, the bathrooms are located right near the balcony-like area (but those are just the washbasins), which may yet be a debatable choice but hey, no one's judging here. 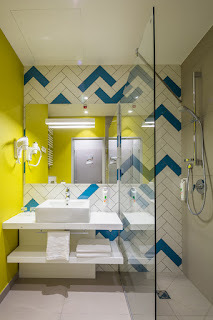 The bathroom still looks uber-fashionable with its chic blend of colours and modern designs, and the unconventional patterns of the entire hotel. Yes, this is something we will like to have! A lot has been said about the hotel by now, and so, we feel it is time to take a look at the bigger pictures now. Consider first the room. We already know that the room is brimming with voguish designs and quirky interiors, and that the designers have fulfilled their promise of doing something different for the Ukrainian image. The photograph exemplifies that. As is quite apparent from the photograph, the room is provided with all the facilities that one needs, along with the amenities and the luxury one requires. 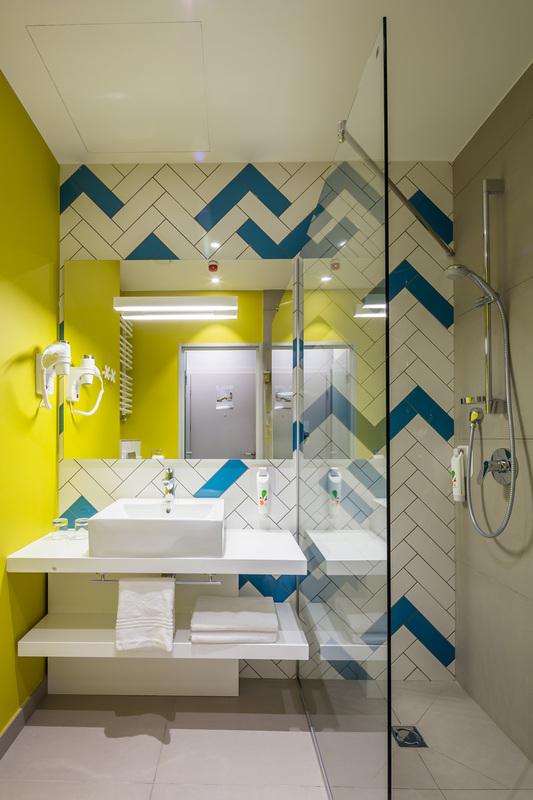 The hotel is a classic example of the kind of economic hotels Ibis Styles is famous for. We have approached the climax of our article now and there is no better way to end it than with one final look at the bigger picture of the bathrooms. Yes, the bathrooms are just as trendy as the other parts of the house and yes, the bathrooms are also different in manners of what are usually associated with an ideal bathroom. And we believe that is what lends them the beauty that they so very well present us with. The bathrooms are a typical example of the beauty that this place expresses and if our words do not convince you, then just take a look at the photograph above. So, there you go, folks. We just took a visit to the famous Ibis Styles Hotel in Lviv, Ukraine; a fine new addition to the popular and trendy Ibis Styles Hotels located all across the globe. This hotel in Ukraine is a must-visit for anyone who goes there, and we believe we have already made enough arguments in favour of as to why it is the place to go to. Have a happy stay, readers.